LaCie has announced a new addition to its Little Big Disk line with a pair of RAID'd SATA III solid state drives in either 512GB or 1TB total capacity. The company positions the drives towards "the creative pro on the go", supporting either RAID 1 for security, or RAID 0 for extra speed. Today, LaCie announced that the Little Big Disk Thunderbolt Series, design by Neil Poulton, now features SATA III SSDs (6Gb/s interface). 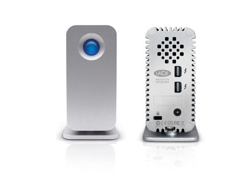 With read speeds up to 635MB/s, the LaCie Little Big Disk is the fastest portable Thunderbolt solution on the market. It can transfer a 50GB project in less than two minutes or edit six uncompressed 422 streams at the same time. A game changer for content creators and professional users – the LaCie Little Big Disk delivers fibre channel rackmount speeds in a portable solution. The SSD models include one Thunderbolt cable and are priced at $699 for the 512GB model, and $999 for the 1TB model. So expensive... I really just want something to plug into Thunderbolt that I don't have to pay upwards of $1000 for. so what LaCie is really telling us, is that what "creative pros on the go" really need, are power outlets & multi-sockets? With SSD prices on the decline, 512GB RAID SATA III with only TB at those prices is outrageous. Yeah, it's fast and full of awesome. Still prohibitively expensive. Let's give it another 2-3 years. This is targeted at people who are maybe editing video. So the 1TB version costs $1,000. My question is, "What did it cost you to shoot 1TB of footage?" So now you have 1TB drive filled with video. Even if the drive cost $1,000 that is "nothing" compared to the cost of the data on the drive. So it is affordable to people who have a real use for this. It is not meant to be used by people for web surfing and email. Pity you can't buy a Mac Pro with a thunderbolt port to plug this drive into. Is it though? On newegg the cheapest 512GB SATA III SSD is $350 with a rebate, and it is OCZ's budget line. Other than that they range from $400-$600. In the 1 TB drive you get two of them, plus the enclosure and a thunderbolt cable which doesn't seem to be out of line to me. The LaCie is almost 3x the real world transfer speed and less than 1/4 the capacity. That's what you are paying $100 more for. It's a near record speed for a portable content capture and edit device, not a long term storage device. I am pretty sure the smallest lens the crew will use is about $5k, so this is trivial.